Maxi-Matic may not be as recognizable a name as other major brands but this company has been in the kitchen appliance business for over 25 years. The Maxi-Matic ERO-2008S Elite ProToaster Oven with Rotisserie and Grill Top can easily replace or supplement several appliances in and out of your kitchen. You won’t need your toaster, grill pan, griddle, outside grill, or oven on a number of occasions when you use this multi-tasker. The ProToaster measures 16*20.1* 14.1 inches (H*L*W). At 19 pounds, this appliance is sturdy enough for its many uses and its size makes it convenient to set on the counter without taking up too much room. With 1500 Watts of power this toaster oven is serious. You can easily adjust the functions and appropriate temperatures for them from 150 degrees F up to 450 degrees F.
Capacity – This handy appliance is 08Cu Ft and it has enough room to cook everything from an entire chicken to a 12-inch pizza. Versatility – There are 8 different cooking options you can perform with the Maxi-Matic ERO-2008S Elite ProToaster Oven with Rotisserie and Grill Top: toast, broil, grill, bake, rotisserie, griddle, steam, and keep warm. Rotisserie – It has a rotisserie for cooking tasty poultry or roasts and reducing unwanted grease and fat. Additional Extras – There is a handy timer that can be set for up to 60 minutes, which makes it better than those with 30 minutes timer. It has a bell to alert you and will automatically shut off the oven or you can adjust it to keep your food warm. The oven comes with a small pan. 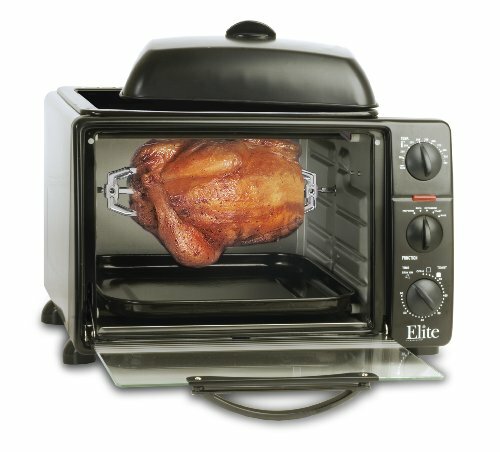 What Do Owners Say About The Maxi-Matic ERO-2008S Elite ProToaster Oven with Rotisserie and Grill Top? The majority of the customers who purchased this model were very happy with the product, which has a over 4 stars rating on Amazon. Quality -This toaster oven is solid and sturdy. It can hold a 3-pound chicken in the rotissiere position or a large pork loin you can roast. Versatility – This appliance replaces so many items and other appliances that it will become your go-to product in the kitchen. The fact that you can toast your bread on the inside while you cook some eggs on the top griddle means you can have a hot breakfast all at the same time. Performance – Everyone who gave high ratings to this toaster oven found that it worked well in all, didn’t put out much heat when it is in use and was also space-saving. Price – Considering the number of functions that it could perform this product is well worth every cent. Rotisserie – Of the people who gave this product a bad review some were because of the rotisserie function. Some could not get it to turn while trying to cook a chicken. You will have to tie up a chicken well to make sure not pushing against the top. Temperature – Calibrations There were several people who said that the oven temperatures were not correctly calibrated. One person checked after her pizza burned and found that the temperature reading on the oven said 400 degrees but was really 475 degrees. Clean up – Many customers found the Maxi-Matic ERO-2008S difficult to clean with some areas hard to reach. Almost all of the people who purchased the Maxi-Matic ERO-2008S Elite ProToaster Oven loved it and appreciated the fact that they could do so much with it. Not having to heat up the kitchen with the main oven is a major benefit but many people purchased this product for the rotisserie function. Some people had problems with this function but there were many who were very happy with it and had no problems at all. If you do have a problem make sure you notify the company right away so you can reconcile any issues. Furthermore, make sure that you have 17 inches of vertical space measurement to place this toaster oven. Although it’s not quite that tall, you need to have space to reach the warming lid cover to remove it.